It’s a new year for the Maricopa Advocate Program (MAP). This week, the City’s Economic Development Department welcomed new members to become advocates for their hometown. More than 100 people showed up Thursday evening at city hall. The purpose of MAP is to educate citizens about their community, so they can become ambassadors for Maricopa with their friends, on social media and when they travel. 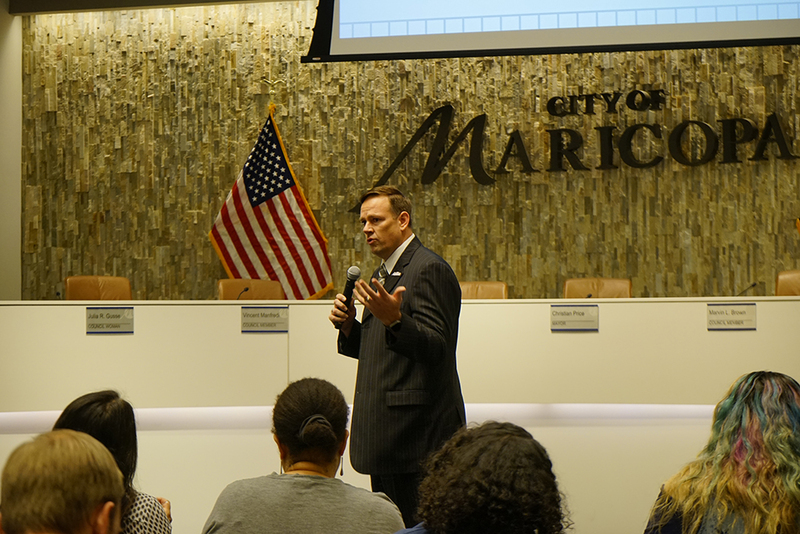 Mayor Christian Price welcomed the large crowd of new MAP members. He said the idea behind MAP was to help the city survive the economic recession of the past. “Now we are fine. We have dealt with housing prices and some of these issues,” Price said, adding he asked a friend to help him run for mayor when he set his eyes on the mayor’s office. Price joked that his friend who helped him run for office no long says people are trying to leave the city. “We needed to get people to understand the story of what we have here. What is our mission? Where do we come from? What is our relationship? What is our cultural diversity? Why is it that when I look across this group and I see so many diverse faces? That is what makes us great,” Price said. He said the people who live in Maricopa need to learn together, as a group, about how and why the city works. “What is really going on? That is separating fact from fiction,” Price said. Denyse Airheart, Maricopa’s director of Economic Development, said MAP participants receive points for each planned and unplanned MAP meeting or function during the year. MAP members also receive points for volunteering as they learn about their community. Price said one of the most important jobs a Maricopa Advocate can do is represent the truth when talking to people. All too often the rumor mill contains incorrect information, and the advocates can correct that information and stop a rumor in its tracks. “How many of you have even been in the garage and your neighbor comes in and says, ‘I heard this?’ Well let me correct you just a little bit – not to be rude. But you can set the record straight,” Price said. He said the idea of the MAP program is to create an “Army of Advocates” for the City of Maricopa and to inform them about what is really going on in the community. Dduring the recession people thought very negatively about Maricopa, he told the MAP participants. The “Army of Advocates” changed that with positive attitudes and words.